A new Laois Passport has been published to encourage adults and children, tourists and residents alike to explore the wonderful heritage sites of Laois this summer. The passport, produced in a collaboration between Laois Offaly Education and Training Board and Laois County Council with the support of the Heritage Council, details 7 of the heritage sites of Laois, with a space for a passport stamp each time a site is visted. Stamps are available at Timahoe Heritage Centre (and the Corner shop in Timahoe), Mountmellick Museum, Donaghmore Workhouse, Dunamaise Arts Centre and Portlaoise Tourist Ofice, Abbeyleix Heritage House and Emo Court. 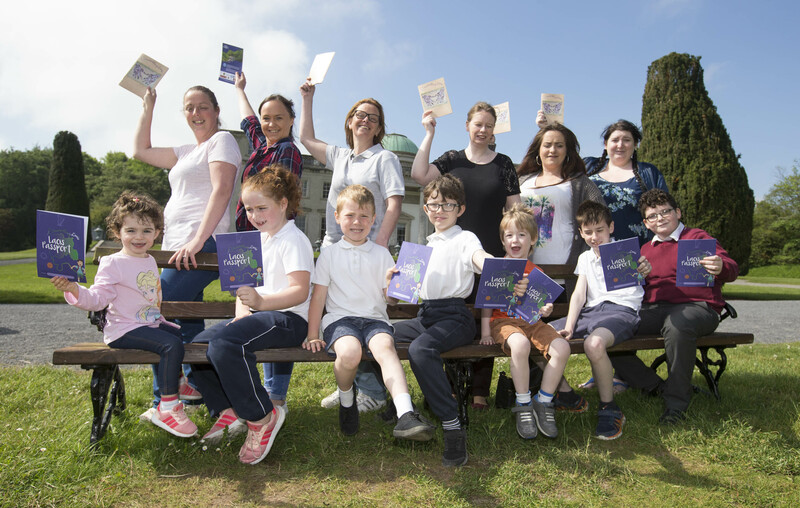 Participants in the Laois Offaly ETB literacy project: Serena Fitzpatrick, Edel Phelan, Hilary Doran, Sabrina Bowden, Karla Jordan and Nicole Delaney with pupils from Scoil Bhríde, Portlaoise at Emo Court for the launch of the Laois Passport for Heritage Sites. Passports are available from each of the sites featured, and the Tourist Office in Portlaoise. They are also available for collection by primary school teachers at Laois Education Centre, and can be downloaded here. Drop in to any of the heritage sites featured to collect you passport or download it here – happy travels! Click here to explore Laois using our new Laois Heritage Trails App, supported by Fáilte Ireland and Ireland’s Ancient East. A wide range of events is held each year, with the aim of raising awareness of the wonderful built, natural and cultural heritage of Laois. As much as possible, we work in partnership with other groups locally (Laois Heritage Society, the Laois Branches of the Irish Wildlife Trust and BirdWatch Ireland, Abbeyleix Bog) and nationally (the Heritage Council). Events take place during Biodiversity Week, Heritage Week, Science Week and at other times throughout the year. The Heritage Office also promotes participation in national programmes and events, such as the Heritage in Schools Scheme, run by the Heritage Council. If you have any idea for an event during Heritage Week or at any other time, to celebrate the heritage of your local area, contact the Heritage Office for advice and assistance. We are available to help community groups and individuals with the planning and development of heritage projects of all types, including providing information on possible sources of funding for heritage projects, or conservation of historic buildings. Laois Heritage Office is grateful for the support of the Heritage Council in all aspects of the work we do.